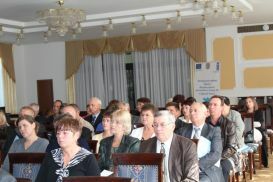 The third phase of the EU / UNDP Community-Based Approach to Local Development (CBA) Project was launched today in Odessa with regional and local authorities, civil society organizations, private sector companies and the media gathered together to discuss cooperation for promoting community-led activities further to improve the living conditions of people in Odeska oblast. Distinguished attendees included Mrs. Inita Paulovica, the UNDP Deputy Resident Representative in Ukraine, Mrs. Oksana Remiga, UNDP Ukraine Senior Programme Manager, Mrs. Elena Ruditch, CBA Project Community Development Specialist, Natalia Chehodar, First Deputy Head of Odessa oblast state administration, Petro Khlytsov, Deputy Head of Odessa oblast council, leadership of rayon state administrations and rayon councils; and heads of village and city councils. “The CBA Project during the first two phases has empowered local people to choose their own priorities for community development, and to play a leading role in activities to meet those priorities,” said Mrs. Paulovica. 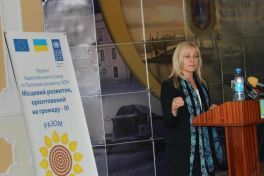 “The third phase of CBA project will continue promoting democratic values and sustainable development agenda that are commonly shared by UNDP and Government of Ukraine. The CBA proect is a platform which now unites the whole of Ukraine. Through this platform, communities can be proactive in implementing what they see are the most important activities to improve their lives. We also sincerely appreciate the cooperation between authorities and local communities which was crucial for the success of CBA at all levels”. “The CBA methodology has proved to be an essential tool for bringing positive changes in the local governance and in the living conditions of the people,” said Mrs. Remiga. “We highly value the partnership between local communities and the local governments that has contributed to these positive changes. We will rely on such a strong collaboration during CBA III as well. Third phase of CBA Project will support the Ukrainian Government in strengthening local self-government and implementing of the policy on decentralization. CBA-III will dedicate its efforts to knowledge management and policy dialogues, because local development is the key for the future of Ukraine”. In its third phase, CBA project will strengthen capacities of regional and local authorities to practice participatory governance, as well as intensify community-based approach in Odessa region. CBA activities will focus on rehabilitating basic social and communal infrastructure in the priority areas of energy efficiency, health, environment and water management together with promoting small farm and non-farm businesses in rural areas. It will support the Ukrainian Government in developing policies in the area of decentralization and share innovative approaches and good practices on participatory governance and community-led local sustainable development through knowledge hub and the curriculum of twenty regional universities. Implementation of the first phase of CBA Project commenced in Odessa region in March, 2008. First phase was succeeded by a second phase in July 2011. Over these two phases, 112, 172 men, women and children of the Odessa region have benefitted from improvement in 50 schools/kindergartens, 13 healthposts, 23 water supply, 7 street-lightning and so on. This happened through joint effort of the citizens, oblast/rayon/local level governments, CBA Project and the private sponsors.